A herniated disk most often results from wear and tear on the spine as you get older. Sometimes it’s caused by an injury. Symptoms of a herniated disk may start slowly or suddenly. Where you have symptoms depends on where the herniated disk is in your spine. The most common symptoms are numbness, tingling, pain, or weakness in your buttocks, shoulders, legs, or arms. Gluteal stretch: Lie on your back with both knees bent. Rest your right ankle over the knee of your left leg. Grasp the thigh of the left leg and pull toward your chest. You will feel a stretch along the buttocks and possibly along the outside of your hip. Hold the stretch for 15 to 30 seconds. Then repeat the exercise with your left ankle over your right knee. Do the exercise 3 times with each leg. Quadruped arm and leg raise: Get down on your hands and knees. Pull in your belly button and tighten your abdominal muscles to stiffen your spine. While keeping your abdominals tight, raise one arm and the opposite leg away from you. Hold this position for 5 seconds. Lower your arm and leg slowly and change sides. Do this 10 times on each side. Lie face down on the floor for 5 minutes. If this hurts too much, lie face down with a pillow under your stomach. This should relieve your leg or back pain. When you can lie on your stomach for 5 minutes without a pillow, you can continue with Part B of this exercise. After lying on your stomach for 5 minutes, prop yourself up on your elbows for another 5 minutes. 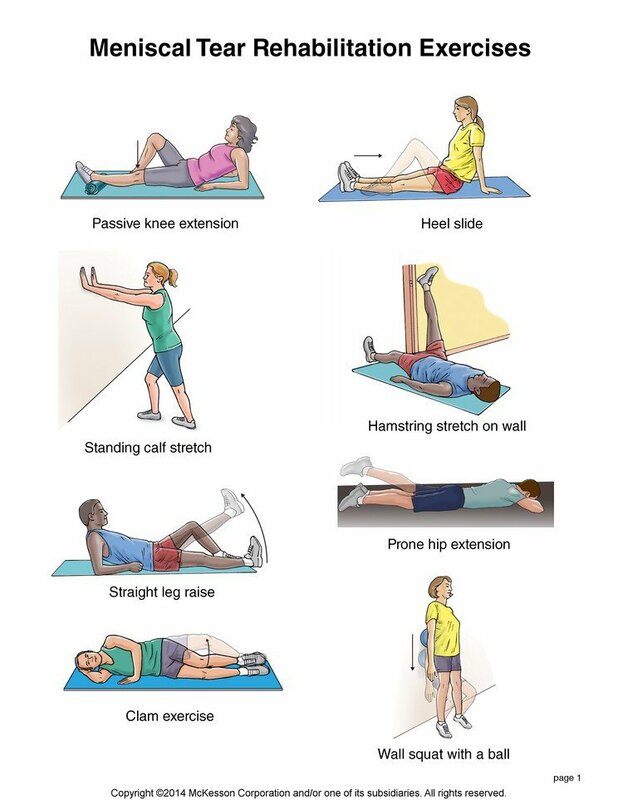 If you can do this without having more leg or buttock pain, you can start doing part C of this exercise. Lie on your stomach with your hands under your shoulders. Then press down on your hands and extend your elbows while keeping your hips flat on the floor. Hold for 1 second and lower yourself to the floor. Do 3 to 5 sets of 10 repetitions. Rest for 1 minute between sets. You should have no pain in your legs when you do this, but it is normal to feel some pain in your lower back. Dead bug: Lie on your back with your knees bent, arms at your sides, and feet flat on the floor. Draw in your abdomen and tighten your abdominal muscles. While keeping your abdominal muscles tight and knees bent, lift one leg several inches off the floor, hold for 5 seconds, and then lower it. Repeat this exercise with the opposite leg. Then lift your arm over your head, hold for 5 seconds, and then lower it. Repeat with the opposite arm. Do 5 repetitions with each leg and arm. Once this exercise gets easy, raise one leg and the opposite arm together. Hold for 5 seconds. Lower your arm and leg and raise the opposite arm and leg up and hold for 5 seconds. Do 3 sets of 5 repetitions. Walking is also good exercise for you. If you have a herniated disk, you should not drive or sit for more than 30 minutes at a time.